John Smith won the Fenland Rods match. What a match Fenland Rods had at Rookery Waters on Sunday with the top four anglers all putting 200lb plus nets of fish to the scales from the Magpie Pool. Top rod and recording his best ever weight was John Smith. 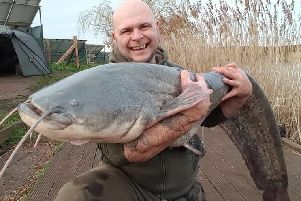 Despite spending some time trying to retrieve his pole with a little help from me after it went in with a big fish attached, he went on to record 232lb 10oz from peg three. In second place on peg one was Kevin Lee, who broke his pole but still managed 216lb 10oz, then came Mac Campbell with 203lb 7oz and I managed fourth with 202lb 6oz. I thought they were really good weights for a club match, and so they were. But just look at the Saturday Summer Qualifier results from the same lake . . .
Saturday Summer Qualifier result: 1 Jack Gill (peg 2) 406lb 1oz; 2 Roger Gowler (peg 36) 332lb 11oz; 3 Lewis Fenton, (peg 1, 301lb 13oz); 4 Mark Pollard (peg 9) 280lb 9oz. In the Thursday Summer Qualifier fished on the Raven Lake, James Boughton on peg three took the honours with 155lb 14oz of carp and F1s. He fished to the far margins and down the edge with maggot and corn on the hook over micro pellets. Second was Craig Shaw on peg 14 with136lb 4oz followed by Smug Smalley with 133lb 12oz. The Over 60s open match fished on Wednesday on the Jay Lake saw Kev Gammon on peg 24 winning the match with an impressive 149lb 14oz. He fished maggot over pellet at 14m and close in to comfortably take the top prize. Roy Whincup came second on peg 47 with 115lb 14oz followed by Will Hadley on 105lb 4oz. Experienced angler Ivan Marriott won the Yaxley, Farcet, Holme and District AC match for the Stokes No.2 Cup at Raveley Drain. He fished hemp in the hope of getting quality over quantity and although it took a while to get them going it was a tactic that paid off. Fishing a short pole line Marriott weighed in 4lb 7oz of roach and skimmers for top spot. Runner-up was Mike Mohan with 3lb 6oz and Paul Marriott was third with 3lb. Deeping St James were over at Coates to fish the Kingsland Large Lake at the weekend with the Newman Cup up for grabs. Most found it slow going until late in to the match, but matchwinner Ray Torrington managed to catch steadily throughout to finish with 86lb 9oz from peg three. Second from peg five was Phil Price with 70lb 1oz and Jon Bowland on peg one was third with 60lb 12oz. Keith Rayment carried his fine run of form into the weekend’s Ramsey & District Angling Society match fished on the Jay Lake at Pidley. Ramsey were joined by Castaways AC anglers for this match which saw a very good turnout on a mild but blustery day. Rayment was well clear of the chasing pack catching some of the lake’s bigger fish. In fact he had carp to 15lb which surprised a few as Jay Lakes is recognised as having a smaller sample of fish stocked in it. Rayment drew peg 11 and had 34 carp on paste and meat to finish with 145lb 4oz.